Foxes Croft offers weekly bookings starting on Saturday and short breaks of 3 days starting on any day in some seasons. Linen, towels, electricity and heating included. This is a comfortable, warm, small detached bungalow within 10 minutes of the coast. It is situated between the larger villages of Dersingham and Snettisham. Although sleeping three it is ideal accommodation for two people. 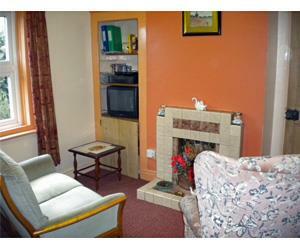 The sitting room has a small settee, easy chair, dining table, television and video. The main bedroom a double bed and the single bedroom leads into the shower room which includes toilet and washbasin. The kitchen includes electric cooker, refrigerator with freezer compartment, spin dryer and microwave. The front garden faces open fields and the back has a secluded lawn and seating area with summerhouse. Further back is the larger mainly orchard area. This part of Norfolk has a coastline which is famous for its west facing sunsets, particularly Snettisham, Heacham and Hunstanton which is also known for its striped cliffs. Inland there are unspoilt picturesque villages to explore, many with pubs serving meals. Parking, heating and linen included. Dogs welcome. Brochure available. King's Lynn take A149 sign posted Hunstanton. At roundabout straight over sign posted Dersingham. Continue straight over traffic lights to village of Ingoldisthorpe. On King's Lynn to Hunstanton. Bus stop 200 metres.